C3. F T oO/ 7V -FOREIGN TRADE ..
million for exports and $3,757.8 million for imports. month in which a merchandise trade deficit was recorded. imports) of $11.1 million was recorded. date of export is considered to be the date of mailing. Represents exports of domestic and foreign merchandise excluding Department of Defense Military Assistance Program Grant-Aid shipments. 2 Defined as exports (see footnote 1, above) minus general imports. 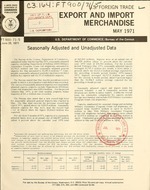 'Data for 1970 and 1971 reflect seasonal adjustment factors introduced in January 1971. 'Represents exports of domestic and foreign merchandise excluding Department of Defense Military Assistance Program Grant-Aid shipments. 3Defined as exports (see footnote 2, above) minus general imports. ,Adjusted for seasonal and working-day variation using seasonal adjustment factors introduced in January 1971.
tion, see footnote 2, table E-1, Report FT 990, Highlights of U.S. Exports and Imports. 3Annual total is not shown for seasonally adjusted data as such a total is not meaningful. Unadjusted data should be used for annual totals. lAdjusted for seasonal and working-day variation using seasonal adjustment factors introduced in January 1971.
aAnnual total is not shown for seasonally adjusted data as such a total is not meaningful. Unadjusted data should be used for annual totals. 4. Animal and vegetable oils and fats 8. Miscellaneous manufactured articles, n.e.c. 'Seasonally adjusted figures for section 7 may differ slightly from the sum of divisions 71, 72, and 73 since each is independently adjusted. this table and similar overall monthly totals in tables 1 and 2 were adjusted independently. 'In the absence of demonstrable seasonal patterns for this section, no seasonal adjustment factors have been applied to date. 3. Mineral fuels, lubricants, and related materials 8. Miscellaneous manufactured articles, n.e.s. this table and similar overall monthly totals in tables 1 and 3 were adjusted Independently. In the absence of demonstrable seasonal patterns for this section, no seasonal adjustment factors have been applied to date.